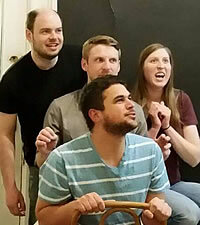 A no holds barred competition where three improv teams compete head-to-head for a cash prize -- and you decide the winner! Only one team will be victorious and your vote counts! 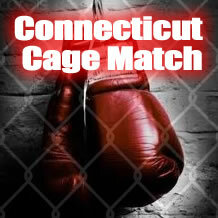 The winner returns to defend their title at the next show of the series. Bring your friends and come vote for the best improv team in this one to one matchup. KnucklePuck: a slapshot that move like a sine curve rather than a direct, straight shot. Four crazy kids from Connecticut team up to annihilate an audience member's suggestion through teamwork, physicality, and a lot of crazy. 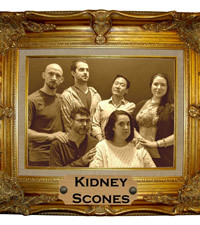 Kidney Scones is a collection of local improvisers who are focused on studying and performing the Harold. They figure that if you're going to do long form improv you might as well do the structure developed by Del Close. The team has studied improv at a variety of schools and theaters and settled on the Harold through a series of debates, arguments, bribes, and ultimately a tournament of arm wrestling. Come watch a series of scenes get developed out of a single suggestion and enjoy the fun! Concrete Tomato was formed in the Summer of 2015 in Hartford, CT. Its members have performed on stages across Connecticut; they have now combined forces for maximum irreverence.